TULSA, OK 10/10/18 – AAA is looking for the region’s most talented bartenders for its Mocktail Mix-Off, a holiday tradition focused on responsible drinking for designated drivers. Registration is now open for bartenders – professional or amateur – to enter their festive, cocktail-style drink recipes minus the alcohol. 2017 Winners, L to R: Rachelle Bailey 3rd Pl; Colby Poulin & Shane Melton 1st Pl; Shirley Baker 2nd Pl. The competition will occur Monday, Nov. 5, at 1 p.m., at the Hard Rock Hotel & Casino Tulsa. Entrants will bring all supplies and prepare their recipes within a limited amount of time for judges. A prize pool of $2,500 is being offered by the Hard Rock Hotel & Casino Tulsa and AAA. First prize winner will receive $1,500, second place $700 and third place $300. The good-hearted competition will be limited to the first 25 entrants. Aside from a chance for cash, each bartender is contributing to a chance to save a life. AAA produces a listing of mocktail recipes on its website showcasing winning bartenders’ drink recipes. Drinks will be judged based on appearance, taste, originality and name by a panel of celebrity judges including local media, restaurant industry leaders and law enforcement. To register for the event, click here. Additional information and rules are available on the website. 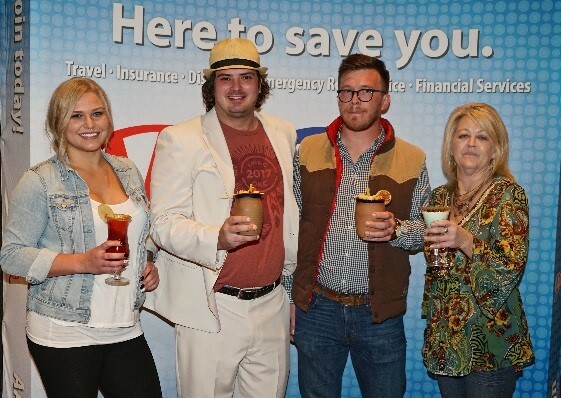 AAA’s Mocktail Mixoff promotes fun and festive options for holiday parties while helping spread the word about responsible gatherings. AAA’s aim is to reduce the number of alcohol-related crashes (and deaths) during the holidays. According to the Oklahoma Highway Safety Office, 27 percent of motor vehicle crashes are alcohol-related. That jumps to 33 percent during holiday periods. The ABLE Commission, ENDUI and Hard Rock Hotel & Casino Tulsa are joining with AAA to sponsor this event.